When I was little I learned not to drink milk from my cereal bowl, I learned to eat neatly and not drop my food, I learned not to play with my food, and I learned that I had to eat what was put in front of me. I learned all the things most of us teach our children. Honey banana rice with pork. 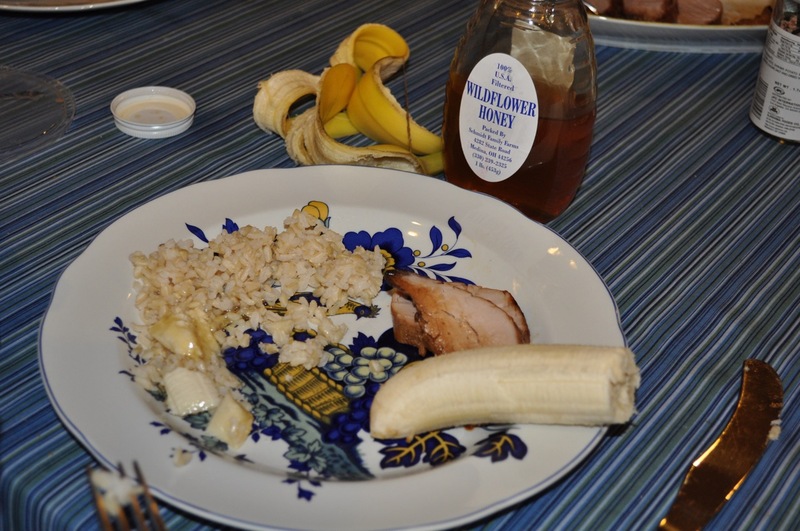 So the other day when my Mom mixed rice, bananas, and honey together at dinner, I was reminded of how many of those rules do not apply anymore. Mom just commented yesterday morning, after she had drunk the milk out of her cereal bowl, "Remember when I taught you not to drink milk from your bowl?" That memory made her smile. It was kind of funny for us to think of how she now does many of the things she taught us not to do. Her hands shake from the Parkinson's so she is sometimes a messy eater and drops her food. She does not always want to eat what is put in front of her so we make her something else. What makes me really happy though is that none of us care about the rules. Who cares if she makes odd food pairings or has a messy spot at the table? She is still the beautiful person she has always been. She is still important and valued. It does not matter that the rules no longer apply. It can be hard for us to watch these changes because these rules are often the ones that people believe split adults from children. They are a sign of ability and health. At first it made me sad to see Mom dropping her food, but that is really just my fear over the progression of her disease, not that it actually matters if she drops the food. As we see these changes, we need to remember that our loved on with dementia is still valued and important. The changes do not mean we are losing our loved one, but that they are transitioning into a new phase in their life that we have the privilege to be with them for the journey. "I Think I Lost My Mother"
It is quite an eye opening experience when you have to walk up to a stranger and say "I think I lost my mother, can you help me?" 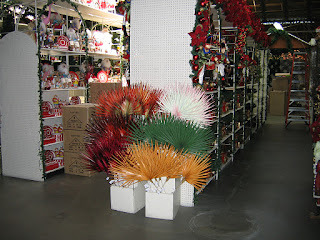 Today Mom and I went to Jo Ann Fabrics, a large craft store. This is a store she knows well so when she said she was going to the restroom a few aisles away and she did not want me to come help her, I said ok. Clearly that was a bad idea. Mom went to the restroom, I put something in my cart, and then I went right over to the bathroom to help her, only to find the bathroom empty. I then checked the men's bathroom and looked all around the aisles and could not find her. I started to panic. I had lost my mother. I went to ask a sales associate who was helping another customer if she saw a woman in a long yellow coat with white hair. When she said no I told her and the customer, "I think I lost my mother, can you help me?" The sales associate was mid-aged, and just seemed to think I was weird. The customer was a little older, and immediatly said "Does your mother tend to wander off?" She understood right away that I was serious and Mom must have dementia. The customer was immediatly ready to help me search the store, when I saw Mom walk across the aisles so I ran over to get her. For a slow lady with Parkinson's who needs a handicapped tag for the car, apparently she can be surprisingly fast at times. When I got to the aisle, I couldn't find her again! A few aisles down I found Mom and all was well. She had gotten lost trying to find the bathroom. We finally got to the restroom and laughed hysterically at how I had lost her. It is funny now, but in the moment it was really scary. I thought I might have to ask the store to go in lock-down like they do when a child goes missing. I had heard of this happening to people, and even Dad had mentioned that Mom has a tendency to wander off when he is getting something off the shelf in the grocery store. However, I figured it would not happen to me because I am faster than Mom and could keep an eye on her. I was so wrong! When Mom first said she was going to the bathroom, I said I would go with her, but she said she didn't want me to. I really wanted to let her maintain some of her independence and since this is a store she knows, I figured I could let her get to the bathroom. I would then just follow a minute later so if she needed me I would be there. It is hard for me to think of needing to care for Mom in the same way I need to care for my child. Actually, I no longer need to dress my son, but I do need to dress Mom. I have no idea where the line is between caring for her so much that I take away what independence she has left, and not caring for her enough so things like this happen. Clearly I need to adjust my idea of how much independence Mom can have and care for her more like a young child. I hate admitting that because it can sound condescending or belittling, but I need to keep her safe. This was another day of change and learning what phase of dementia we are now in.